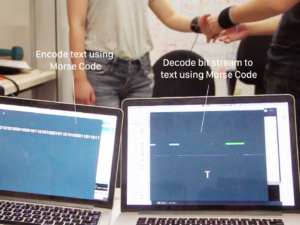 We present an acoustics-based method that utilizes the human body as a communication channel to propagate information across different devices.Through a set of experiments with eight participants, we demonstrate that acoustic signals under 20kHz can be propagated within or between human bodies or even between the human body and the environment. We can detect the existence of touch contact by simply matching the frequency response curves of the received signals; with this approach we achieved an accuracy of 100% in detecting the presence of contact. These capabilities enable new opportunities for providing more natural human-computer interaction experiences and secure personal area networks. We built a system to transmit text with frequency shift keying (FSK) based modulation through the body by using our technology and discuss the potential opportunities and challenges for various potential applications.